The FlatAds WordPress theme is so clean, super flexible and has a fully responsive design (try resizing your browser). Built with HTML5 and CSS3 . A lot of thought and care were put into FlatAds making it a pleasure to use. The FlatAds comes compatible with woocommerce 2.1, bbpress, MailChimp for WP plugin. 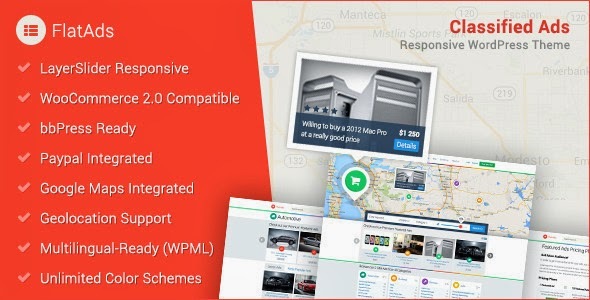 Item Reviewed: Responsive Classified Ads WordPress Theme 9 out of 10 based on 10 ratings. 9 user reviews.